2017 Irving Research Mentorship Award recipients, front row from left, Heather-Ann Burrell, Thomas Ciha, and Sean Rowley. Back, Kirsten Gallant, Jamie Forsyth, and Leah Gray. Absent are Craig Duininck and Alison Armstrong. 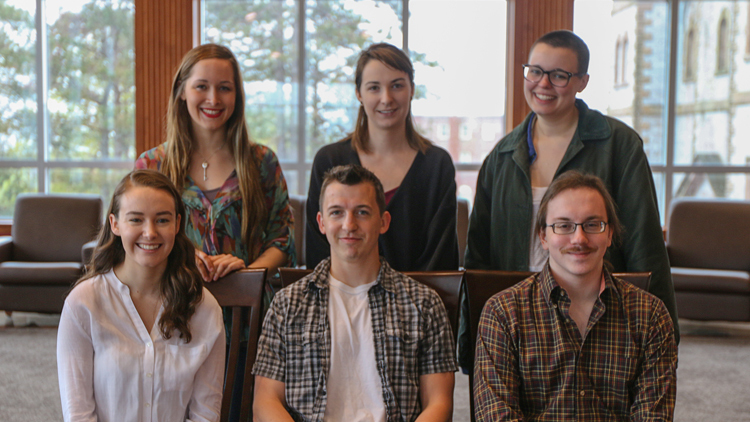 Irving Research Mentorship awards offer StFX undergraduate students the opportunity to be involved in the creation of new knowledge and creative use of existing knowledge through original research carried out under the supervision of a faculty mentor. Funding to support student researchers is provided through the McKenna Centre for Leadership with an endowment established by Irving Oil. Normally a minimum of six undergraduate student Summer Research Internships, worth up to $6250 each, are awarded each year for students enrolled in Bachelor programs at StFX. The Internships support full-time employment as a research assistant for a minimum of 12 and a maximum of 16 weeks during the summer (May-August) period.